Handaxe from Murzuq in southwest Libya. 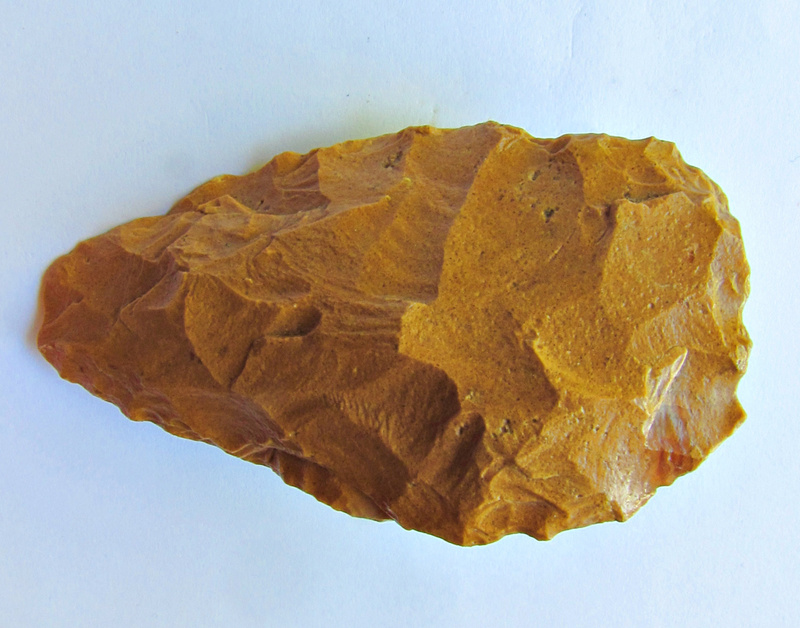 This is a small handaxe from the Desert near Murzuq. Murzuq is an oasis in South-Western Libya on the northern edge of the Murzuq Sand Sea (Idhan Murzuq). Murzuq was once an important assembly place for caravans to Lake Niger and Lake Chad, a centre of the Arab slave and arms trade, and the traditional capital of the Fezzan province during the 16th-19th century. Murzuq basin extends about 400 km from west to east and 450 from north to south, near the border with Niger and Algeria. This enormous sand sea is a massive, “monolithic” desert east of the Acacus mountain range and south of Wadi Metkhendoush. The Idehan Murzuq offers some of the world's greatest sand dunes and covers an area almost the size of Switzerland. Anyhow, during the Middle Pleistocene and early Holocene, the region contained a series of interconnected lakes and rivers, facilitating human and animal dispersals. One has to be sceptical about a “pebble culture”, reported from Wadi Berguj and other scatters although they can be suggested as pretty “old” according to the grade of their patination. There are certainly large clusters of an Acheulean industry, made on local raw-material. 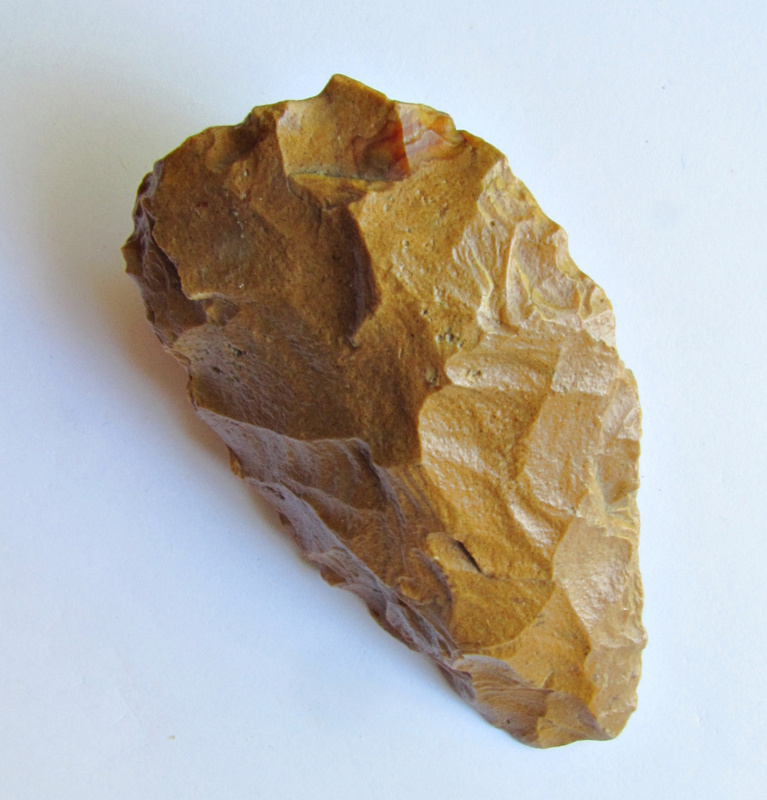 Acheulean handaxes are found in large numbers over areas of thousands of square kilometres; on the Hamada of Murzuq, on the bottom of its wadis, and between the dunes of the sand seas. Some of them are clearly linked with tools produced by Levallois technology. An early paleolithic site with environmental and stratigraphic information has unfortunately not been detected up to now. Aterian / MSA artifacts are known for example Wadi Habeter and the Wadi Tilizzaghen. We will show a developed MSA from the area during the next post. A Holocene wet episode is testified by abundant “Neolithic” sites, tools and Rock art, which consists of wonderful engravings. The absence of paintings in the region of Murzuq is due to the geology of this plateau which is composed of Mesozoic « Nubian » sandstones that do not allow the formation of natural caves which are the only places where paintings can escape the destructive processes of weathering.